Any scuba diving professional will recommend buying a computer as your first piece of dive gear. This is because they allow you to dive safer and longer than if you were only using dive tables. When it comes to the safety and enjoyment of the sport, having your own dive computer is the way to go. But, with so many different types, brands, and features to choose from, finding the best one for you can almost seem impossible. No need to worry thou, I have done much of the heavy lifting for you. I have researched many different computers, read countless reviews and ratings, and have created a top 10 list of the best dive computer available today. I have also put together a quick buying guide to help you find the one that best suits your diving needs and reviews of each computer on the list. What are the Best Dive Computers? Below is a list of the top ten best dive computers as well as a chart to compare their most important features. They are arranged in no particular order but are selected from different price points to ensure that there is a computer for everyone. Below you will find reviews of each dive dive computer on our list arrange by different price point. The one that right for you would will generally be determined by your dive level, as well as your budget and personal preference. If you’re still not certain which computer best suits your diving needs, then scroll below to read our dive computer buying guide. In this price range, you will find computers that are great if you prefer diving more simplified or if you’re just starting out. To keep the cost down, these computers have the bare minimum. They generally have key diving features with a log book. The Suunto Zoop Novo is a great choice for any diver just starting out or looking for a simple-to-use dive computer. 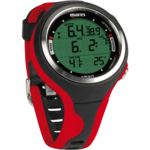 It features 4 dive modes including free diving. Big easy-to-read partial dot matrix display with easy to use menu-based user interface Clear and easy to understand logbook with a graphical representation of your dive. 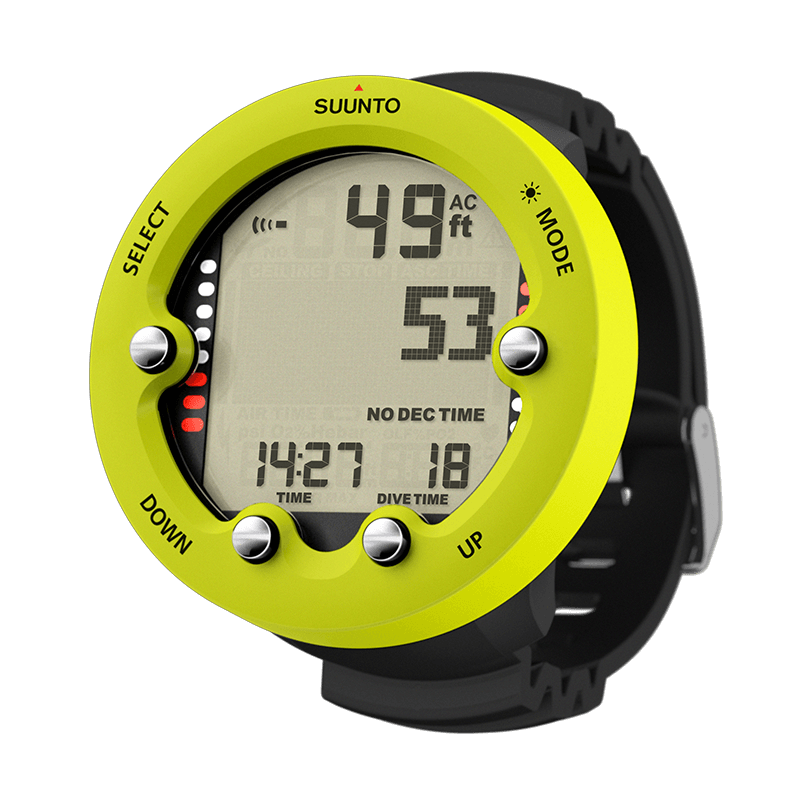 The bottom line is the Suunto Zoop Novo is one of the best entry-level dive computers you can find on the market today. The Mares Smart is a compact entry-level watch-sized dive computer with Nitrox Capability and the ability to switch between 2 gas mixes. It also has free-diving mode with dedicated alarms if you’re a serious apnea diver. 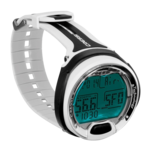 It also features a dive planner with additional surface interval function, standard watch functions including second-time-zone, stopwatch, and date, as well as user changeable barriers. The bottom line the Smart is the Quintessential dive computer. It does what it needs to do, and nothing more. A great choice if you’re just starting out and looking for a dive computer watch. 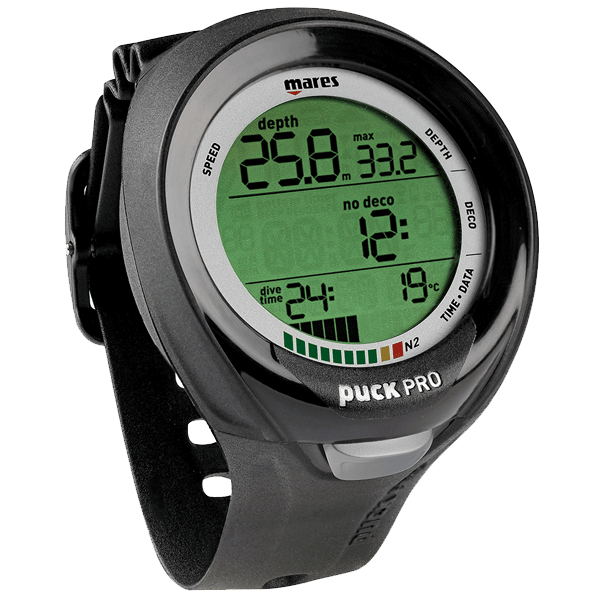 The Mares Puck Pro Plus is a large display entry-level dive computer. It geared to new divers or recreational diver who like simplicity. The large segmented display has large digits, which makes it very easy to see how deep you are and how long you can stay there at a glance. Although the display is large, its profile is very slim and streamline on your wrist. An intuitive user interface with single button operation also makes programming the computer stress-free, even if you’re setting it up for the first time. The bottom line is the Puck Pro Plus makes a great choice for your first dive computer or a great backup. The Cressi Leonard dive computer is designed to be very simple to use and easy to read. It has both Air and Nitrox Capability and available in a wide range of colors. The single button user interface makes navigating menus and settings quite simple and the large display makes reading critical dive data easy. Audible alarms also alert you when important criteria are reached. The bottom line is, the Leonard is a computer you should definitely put on your short list when looking for a top to the line entry level dive computer. In this price range, you will find computers that are more robust and great for medium to advanced diving. These computers generally have air integration, digital compass, and multiple gas mixes. The Suunto D4i Novo is neat looking watched-sized dive computer packed full of great diving features. It has 4 modes including watch, air, nitrox, and a dedicated free diving for those who are serious about the sport. It also has optional wireless air interaction allowing you to read current cylinder pressure and dive time remaining. 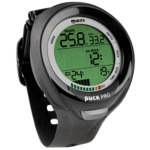 Is easy-to-read partial dot-matrix display makes programming effortless and even allows the dive log to show a graphical display of your dive profile. 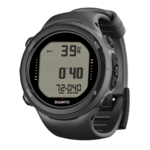 The bottom line is the Suunto D4i Novo a compact all-around dive computer that makes the perfect travel companion no matter where you go diving. 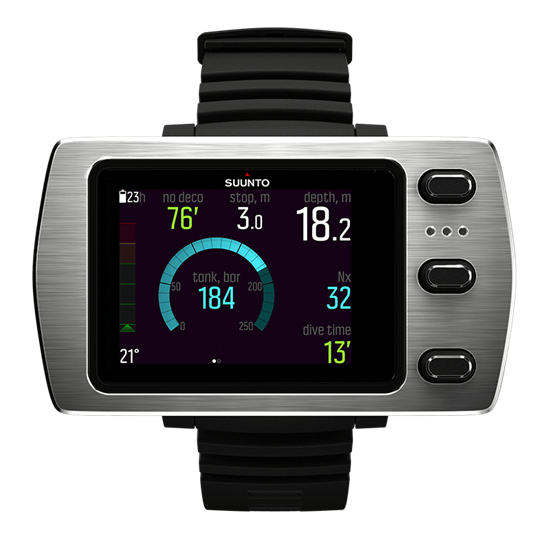 The Suunto Vyper Novo is a feature-packed dive computer designed with 5 modes including air, nitrox, gauge, free-diving and off. Advanced features such as optional wireless air integration, digital compass, and gas switching ensure that the Vyper is the perfect dive companion no matter where our diving career takes you. A large dot matrix display and four buttons user-friendly interface makes it one of the easiest dive computers to operate, even with minimal training. The bottom line is, the Suunto Vyper Novo is a robust recreational dive computer great for intermediate to advanced diving. In this price range, you will find more high-end dive computers designed for more advanced diving and divers who simply want the best for all diving. They may include features such as a color screen, rechargeable battery, and features and display customization. The G2 (Galileo 2) is the newly upgraded version of Scubapro’s top of the line dive computer the Galileo. While still maintaining many of the features we have grown to love from its previous version. The G2 has now become more versatile with all the conventional recreational dive modes, as well as tech modes, including CCR, Trimix, and Sidemount. Even freediving mode if that’s what you’re into. A bright color screen display draws your attention to what you need to know and a rechargeable battery gives you up to 50 dives per charge. 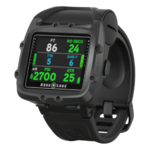 It can no store up to 1000hrs of dive profile and downloading your logbook to your PC, Mac, iPhone, or Android could be easier with new Bluetooth technology. With all of its many new features, it is still very easy to use and operate. One of the main selling points of this computer is its flexibility and customizability. Allowing you to use as little or as much of the technology as you want. The bottom line is, the G2 is a fantastic all-around dive computer if you’re a new diver just starting out and want a computer to that will follow you no matter where diving takes you or a tech diver who need 9 gas mixes or closed circuit rebreathers. It’s simply designed to go anywhere. 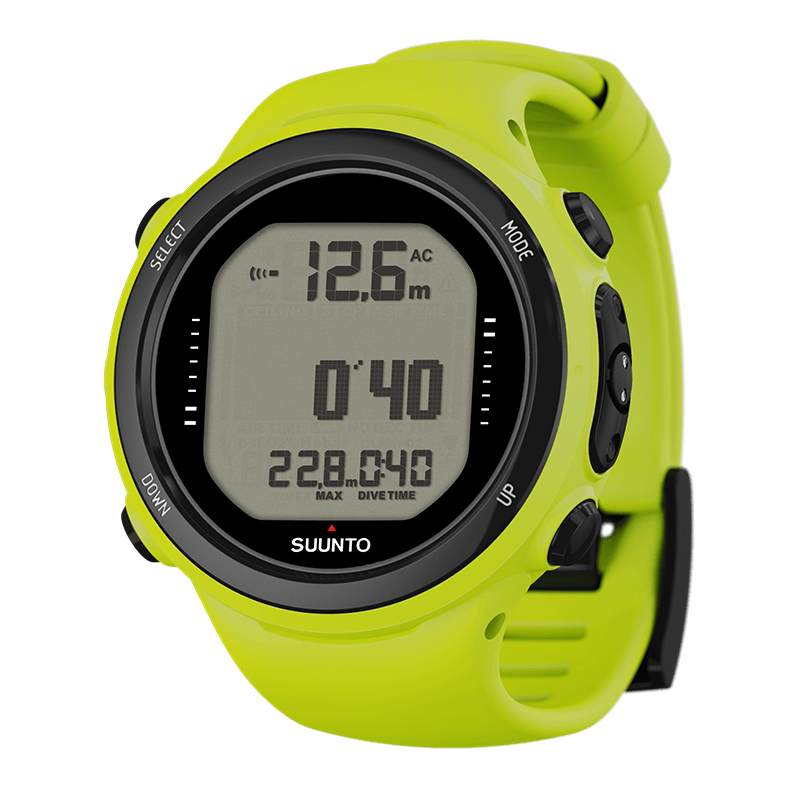 The Eon Steel is Suunto’s flagship dive computer. 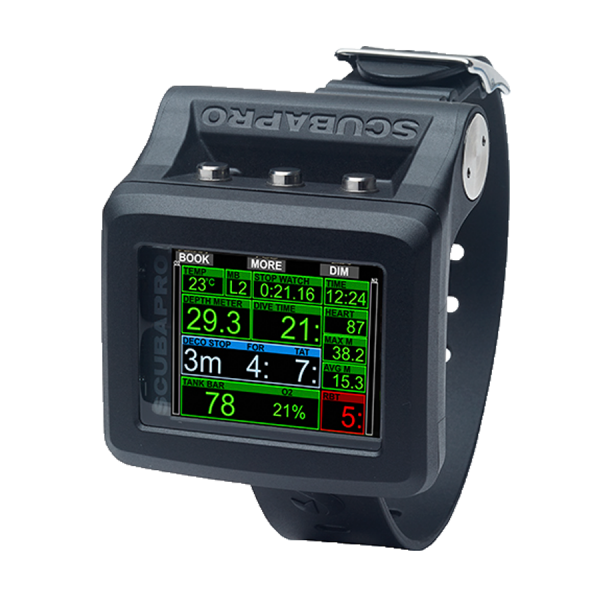 It is a fully customizable dive computer, with a bright color screen, and easy enough for anyone to use from novice to expert divers. A rechargeable battery will give you up to 40hrs of uninterrupted diving per charge while saving you on maintenance cost and batteries. The 3D digital compass is tilt compensated up to 45 degrees, so you no longer have to hold your arm perfectly level to get an accurate reading. It will also store up to 200hrs of your recent dives, allowing you to go for months without having to download your dive log to your PC, Mac, or mobile device. It’s also very versatile with expert features for Trimix diving and Closed Circuit Rebreathers. While also giving you the ability to customize every aspect of the interface. Choose what information is shown and where it is shown. 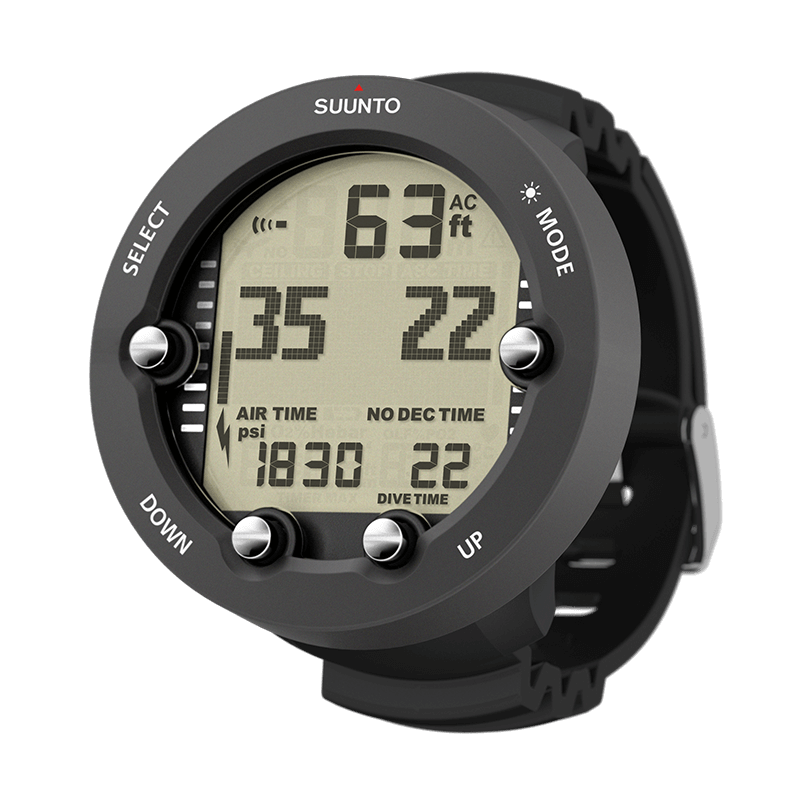 The bottom line, Suunto has built the best large-screen air-integrated wrist mounted dive computer on the market to date. 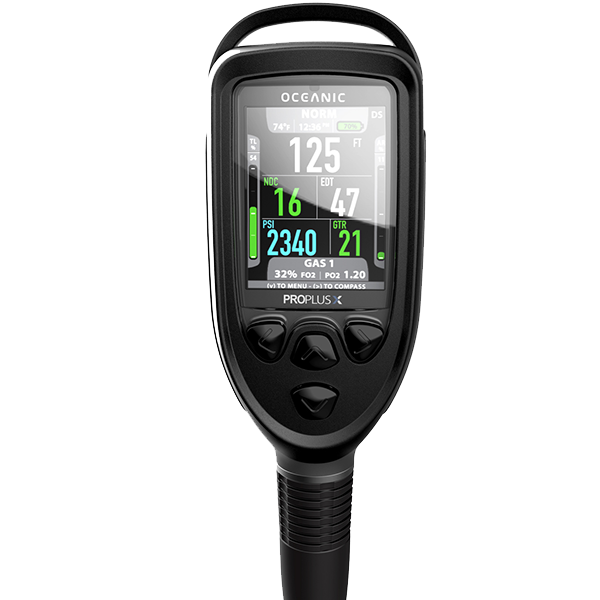 Whether you’re a beginner diver looking for a dive computer to have through your diving career or a tech diver who dive with Trimix or CCR this is the perfect all-around dive computer. The Pro Plus X is the new console dive computer for the Oceanic Pro Plus line of computers. It has an intuitive 4 button user-friendly interface that is quick to get used to and easy to navigate. The bright color display color-codes your dive data and projects high-resolution bar graphs allowing you to read and interpret vital dive information at a glance. No more squinting, Oceanic claims that this display has the largest and most edible digits of any dive computer available to date. 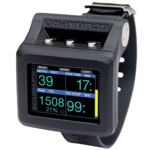 This large display is powered by a rechargeable battery that will provide up to 60 hours of dive time per charge. No need to guess where you’re going either, the Plus X also comes equipped with a tilt-compensated 3D compass that can be accessed throughout the dive with the press of a button. It will store up to 99 of your recent dives and can upload them to your devices wirelessly through Bluetooth. 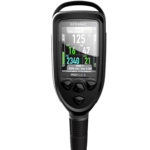 The Bottom line is if you own a scuba regulator and are looking for a fantastic recreational dive computer that is both easy to read and operate look no further than the Oceanic Pro Plus X. 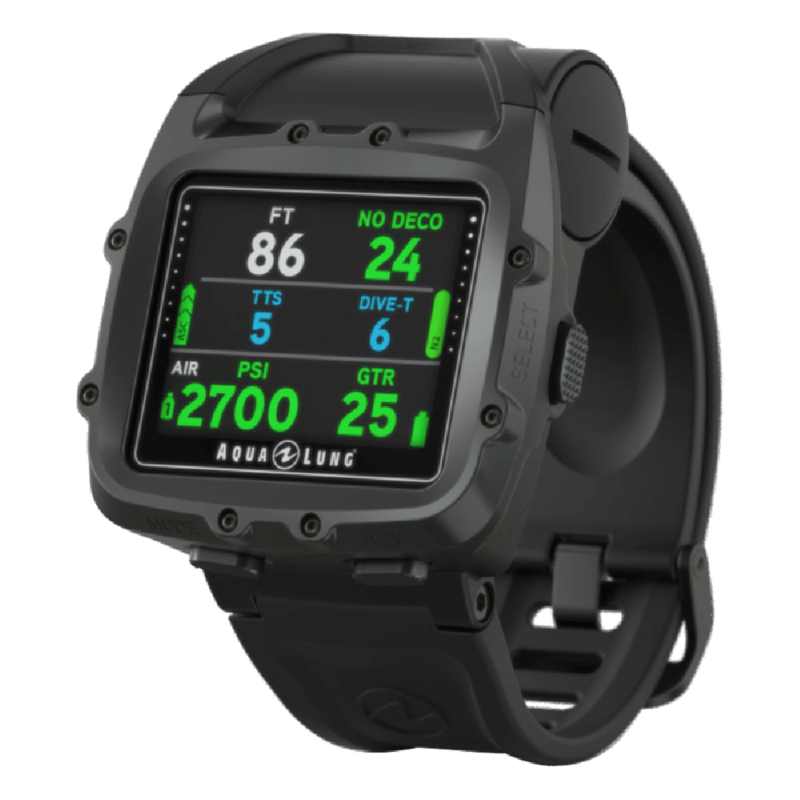 The Aqua Lung i750TC is a great midsize color screen wrist mounted dive computer that can connect to 3 different wireless transmitters. Everything is color coded and very easy to use. Its 3 buttons and menu-based user interface also makes programming and setting up the dive computer very easy once you get your head around it. The 3-axis full-tilt compass is easy to read and makes navigation underwater a breeze. Another great feature is the ability to interact with the dive computer from your smart device (Android/iOS) via Bluetooth. The Bottom Line, this is a great little computer if your planning on doing novice to intermediate diving. Dive computer today comes with many different configurations and features. It can be a little bit difficult to find the right one. This quick guide should give you a basic idea of which computer will work best for you. Non-Air Integrated – Will not give you any information on the air in your cylinder. Air Integrated – Will give you information on current cylinder pressure as well as other information. Air integration can either be wireless or connected by you high-pressure hose. Next, You will need to decide where you want your Info. Wrist Mounted – Allows you to have all your dive information on your arm. This makes it much easier to read and is more streamlined. Console Mounted – These are connected to your scuba regulator via the gauge console. Great if you prefer all your dive info in one place. Watched Sized – These dive computers are also wrist mounted but are the size of your typical watch. Many, are quite stylish and can be worn on land without drawing too much attention. Before choosing a computer thou, there are a few things we must consider before making a decision. What Is Your Diving Level? One of the first things you should consider is your experience level and finding a computer to match the type of diving you will be doing. The requirements for someone just starting out will be completely different from a seasoned diver. Beginner – A simple computer that is both easy to read and use is perfect for someone just starting out. Let’s face it, you’re going to be too busy trying to breathe comfortably and swimming to be messing around with a more complicated computer. Advanced – For more advanced recreational diving or tech diving, your needs are going to be completely different. Having features such as multiple gas mixes or Trimix will be more important to you. Are You Getting Additional Training? However, if you’re planning on getting additional training then you might consider buying a computer with the feature you will need now rather than having to upgrade later on. Spending just a few more dollars now can save you hundreds down the line when you realize that you need a more versatile computer. Your budget is also going to be a determining factor when choosing a computer as well. There is no need to look at computers that are way above your spending limit. Knowing what you can spend will help you choose the best dive computer you can afford. How Often Are You Planning To Dive? If you are planning to dive only a couple times a year there is no need to get a high-end dive computer. A good entry-level computer will give you all the information you need to stay safe. Now, If you are someone that dives often, you may consider a mid-range to high-end with more features to make life much easier. 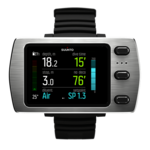 These may include features such as air integration, PC or Mac connectivity to download your dives, and color screen for easier viewing. Can you clearly read the data with your mask on? The main purpose of your dive computer is to display critical dive data. If you’re not to read or understand, then it would be completely useless – wouldn’t it? Let’s face it, a watch-sized dive computer might look great on your wrist out of the water, but if you can’t easily read the information you should consider a computer with a large display. This way you will spend more time enjoying your diving instead of constantly squinting trying to figure out what your computer is saying. If your eyesight is diminishing, you should also consider a color display. They are generally easier to read than traditional displays. Where Are You Planning To Dive? Travel – If you travel for most of your diving a non-air integrated wrist-mounted computer would work best. That is unless you own a scuba regulator of course. This will also you to download all your dive to your computer instead of using pen and paper. It also allows you to dive in your preferred unit of measurement, which can vary from country to counter. Watch-sized computers are also ideal for traveling because they are very lightweight, and save more space.